An author couldn’t ask for a better week. Thanks to the support of a ton of people the debut of The Five Kisses (Sweet Deception Regency #1) couldn’t have been more spectacular. I’ve been celebrating with tea and sticky buns in the drawing room since the promotion started. So many people left their calling cards that my butler threatened to quit. As if I’d let him. Just check what the fans did. #4 in the Top 100 Free! The betting book at Sweet’s Racing Club was overflowing and the ton was literally taken by storm. It’s enough to give me the vapors since this is just the beginning of the series. 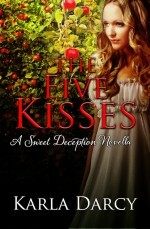 I hope all of you have enjoyed reading The Five Kisses and don’t forget to get the next one, The Masked Heart (Sweet Deception Regency #2) which is available on Amazon now. Now off with you to get your copy today! The world of the theater in Regency times. Wear your domino and cape so that no one will recognize you. As one reader said, “This story sealed the deal for me as a fan. 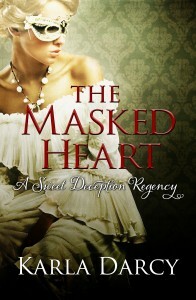 The Masked Heart has the same sharp writing as The Five Kisses and another plot that kept me reading it straight through. The humor and tenderness give the book heart while authentic details and great sexual tension make for a great read. Not only do you learn about theater but watch as Blaine disguises herself as different characters to save her family from disaster. Drew is a true hero!” It’s enough to give me palpitations.